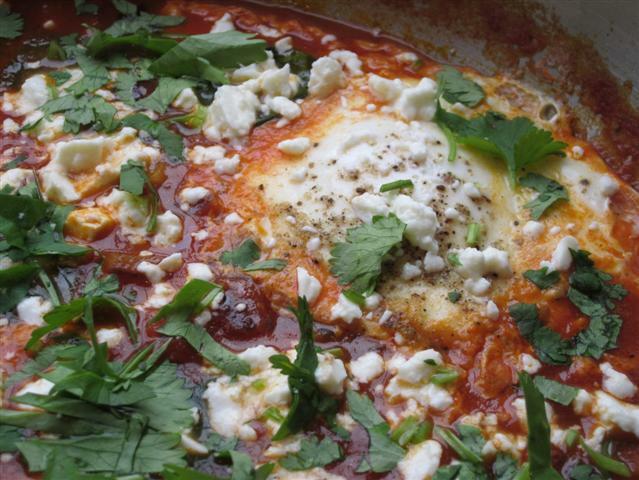 Eggs poached in a spicy tomato sauce – Shakshuka! 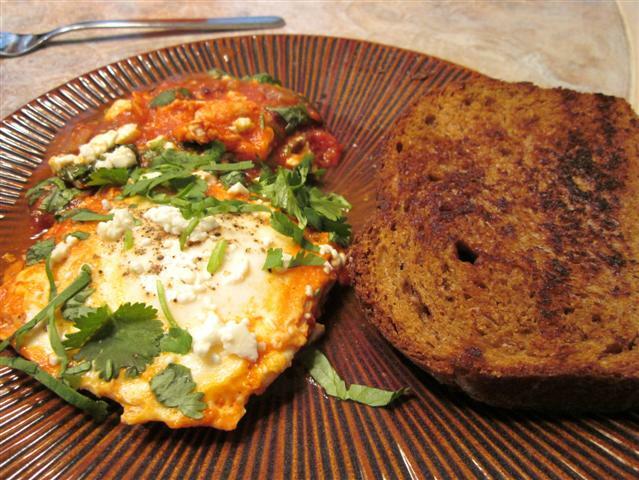 Shakshuka means “all mixed up” in Hebrew and is a popular Isreali breakfast. There is some debate as to the origins of the dish with some claiming it from Libya, Morroco, Turkey and others. (Source: here) When I saw this recipe at foodblog and the dog I thought it looked so delicious and simple and I had all the ingredients for it. When the time came to make it, I started thinking maybe it is too simple, and not worth the extra effort… But I was so wrong!!! It may sound like a simple eggs and tomatoes but the way the flavors come together are really something special. I did not change much, and we had it with my homemade bread. A wonderful weekend brunch! Heat oil in a 10-12 in skillet. Add the green chili and onion and saute for a bit. Then add the garlic. Once the onions are translucent, add in the spices, then the tomatoes and salt. Reduce heat and cook until it is thickened. Stir the mixture, then add in the water and then crack the eggs into the sauce. I like to sprinkle the tops of the eggs with some salt and pepper. Cover with a lid and cook 5 minutes or until the yolks are just set. I accidentally overcooked it, so it was more like soft boiled eggs, but still yummy! Sprinkle with feta cheese and chopped coriander. Serve with warm bread ( I lightly toasted mine in another pan). Sending to DNSW E at Akila’s Kitchen.